Personal attention and service should be the hallmark of any profession and it is especially true with the practice of law. 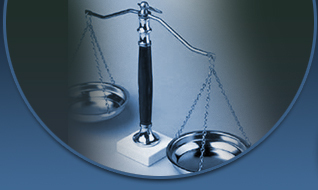 The Law Office of Wayne T. Rife, PC considers this to be extremely important and will work to pay close attention to each client's needs while giving personalized service. 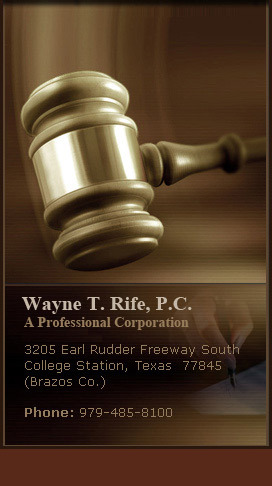 Learn more about the Philosophy of Practice at the Law Offices of Wayne T. Rife, PC. Wayne T. Rife is a 1975 Texas A&M University graduate and a former member of the Texas A&M University Corps of Cadets. Upon graduation, he entered the business world in Pasadena, Texas as a merchandiser with the J.C. Penny Company where he gained invaluable business experience. After four years, Wayne began operating an industrial manufacturing business in Houston, Texas, with sales into Texas and Louisiana. After 11 years of practical business experience, Wayne entered law school in 1986 to pursue a long time dream of becoming a practicing attorney. He graduated from the University of Houston; Bates School of Law, and began his practice with Woodard, Hall & Primm, P.C., a prominent Houston firm. In 1991, Wayne Rife and his family moved to College Station, Texas. Click here to learn more about Wayne T. Rife, P.C. Jana Beddingfield was raised in the small town of Jewett in Leon County, Texas. She is a 2000 graduate of Texas A&M University, where she double majored in political science and international studies. After graduation, she spent a year as a clerk with the Houston law firm of Baker Botts, LLP. Upon finishing her year as a clerk, she moved to Washington, D.C. and attended law school at The Catholic University of America, Columbus School of Law. While living in Washington, DC, Jana practiced as a law fellow for the firm of Wiggins Childs Quinn & Pantazis, PLLC. At the conclusion of her fellowship, Jana relocated to Florida, where she worked at a boutique Fort Lauderdale firm, and began developing her commercial litigation practice.Click here to learn more about Jana L Beddingfield.